You will earn 4,338 Reward Points. Earn 1 reward point for every 1 dollar spent. 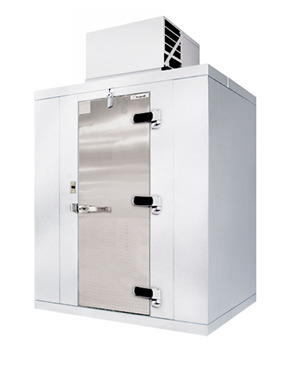 The Kolpak P7-054-CT Walk-In Cooler uses a 1/3 horsepower, medium-temperature, top-mounted refrigeration unit to keep your inventory chilled and fresh. It features a durable 26 gauge embossed galvalume interior & exterior, a .100 smooth aluminum floor, and a 2.5" dial thermometer for quality temperature control. This cooler is 90 inches tall, 58.50 inches wide, and 47 inches deep. Not for use in areas where winds exceed 110 mph and/or the snow exceeds 20 psf. Treat yourself to a brand new Kolpak P7-054-CT Walk-In Cooler and discover the many perks of owning a walk-in cooler. This Kolpak P7-054-CT Walk-In Cooler also comes with a top mounted/ceiling mounted compressor. This cooler is 90 inches tall, 58.50 inches wide, and 47 inches deep.